Architects and designers are challenged to make the environments they design safe, functional, and visually appealing. EOScu is a Preventive | Biocidal SurfaceTM that marries style and function. It has the advantages of a solid surface—durability, virtually seamless fabrication, and a beautiful aesthetic—with the ability to actively kill harmful bacteria* within two hours. No other solid surface manufacturer can offer both form and function. 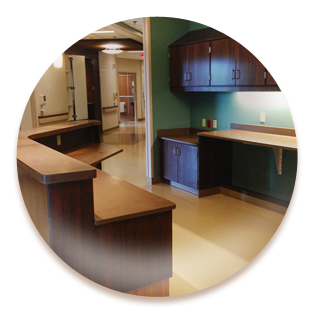 EOScu aesthetic delivers confidence and utility, with attractive design options for high-traffic areas. Its modern style and neutral earth tones enhance any interior space, compliments most designs, and contribute to a positive healing environment. Fully tested EOScu has virtually seamless applications and can be used to create any solid surfaces, such as integral bowls and backsplashes. Molded products are also available, making the opportunities for application endless. With all these added benefits, it’s only 2x the cost of standard solid surfaces usually used in healthcare environments. This is the official warranty document for EOScu. This document is the official SDS document for EOScu. This document is a CSI Masterformat document for architect specification of EOScu. This document is a single PDF file comprised of the Product Specifications Sheets for EOSCU Slabs and Sinks. This document is the most recently updated fabrication manual for use in fabrication and installation. Please contact EOS Surfaces with any questions when referencing the manual. This document is the official Care and Maintenance document for EOSCu. Interested in partnering with EOS? Contact us today.